Finally, do not eat in that area! This could result in tooth fracture and tooth loss! Additionally, eating could result in food impaction and a gum tissue infection. Often you can save yourself a trip to the office if you can simply clean the inside of the temporary off and reposition it back in place. It may remain in place without any cement. If the temporary does not snap in securely, or if you feel that it’s not secure, remove the temporary when eating. Then clean the area and replace the temp after you are finish with your meal. You may purchase an over the counter temporary cement to place your temporary back on with (located in the dental supply aisle), dental adhesive powder or even a small amount of toothpaste works well to help hold it in place until you can make it to the office. Generally, if you are unable to reposition your temporary it is not an urgent situation. The usual time period between preparation and delivery of final restoration is two weeks. If your temporary comes out the last day before your appointment it’s OK just to keep your scheduled appointment. Under no circumstances should you allow any chewing on the tooth without a temporary. The tooth could break. If the temporary comes out between 2-4 days before your scheduled delivery appointment, please call our office first. There is a chance your final restoration has returned to our office early. If the restoration is available, we may be able to bring you in sooner than your scheduled date. Always try the temporary back in without cement to ensure proper fit and while in position check to see if your bite feels normal. Gently bite down on both sides on the back teeth. This must be done before mixing the cement! Hint: During trial seating, observe the correctly seated position. You may wish to mark the temporary on the cheek side. Orientate and seat the temporary. Gently bite down on both sides on the back teeth to seat the temporary until the cement is set. 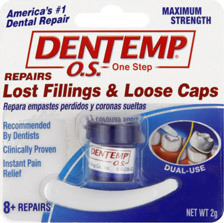 If the temporary seems high in your bite, remove it immediately and start over at step #2. Clean off excess cement. Gently use a tooth pick in a direction towards the gums. We do not recommend flossing or any force that could lift the temporary up. Please note that your temporary is “just that” a temporary. It is made for a temporary period of time (2weeks). The purpose of a dental temporary is to reduce post op sensitivity and hold the tooth in position. Holding the remaining tooth structure in position is necessary since the final restoration is being fabricated to fit onto your tooth in the position the tooth was in when the impression was taken. It’s not usually strong enough to eat on and floss will usually dislodge or loosen temporaries.